You cannot get top flight carnitas tacos in New Orleans, Louisiana. Our food scene is nonpareil but if you tried to live off world-class tacos in Orleans Parish you’d wind up destitute and shaking a tin cup underneath the Claiborne Avenue bridge. I’ve been gone from Texas for six years, and over that time frame I’ve reconciled myself to a sad reality: there are no good tacos in my new homeland. Back in Spring 2017 I started hearing murmurings from San Antonio of a new breed of taco parlor that had opened on the city’s southside. 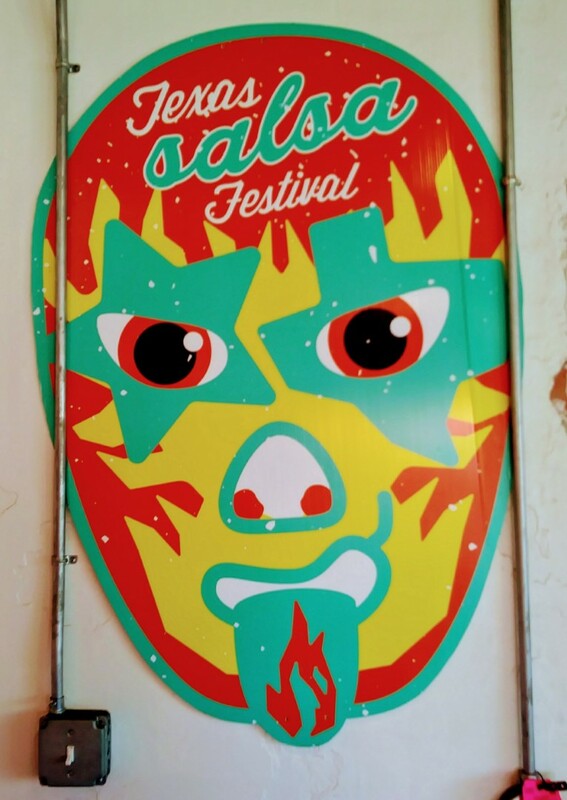 The Alamo City is awash in great taquerias. To penetrate the milieu means that you are doing something extraordinary. 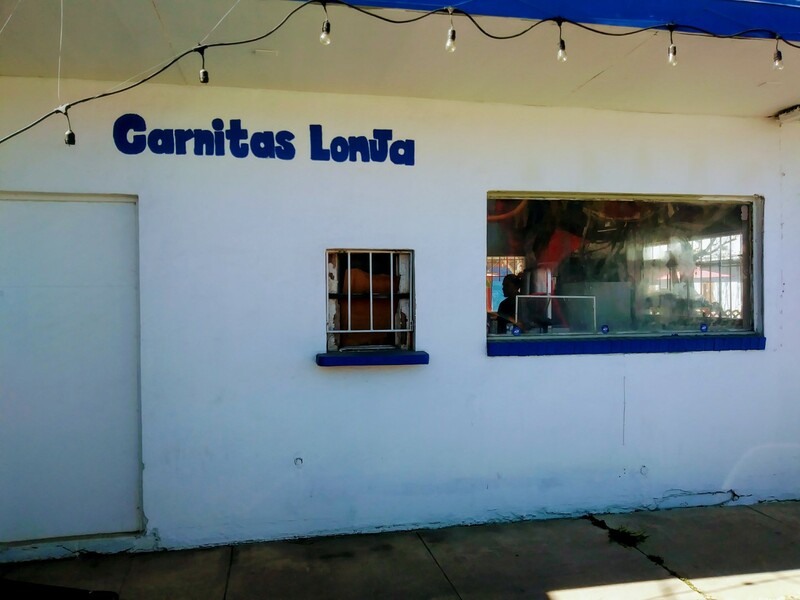 When the clamor over Carnitas Lonja grew into a deafening roar I decided to load up the Econoline and take the nine hour drive to San Antonio to see if meat cook Alex Paredes could possibly live up to the hype. I’ve been fascinated by south Texas since I was a little kid and have visited San Antonio a few dozen times over the years to eat tacos, hang out in icehouses and keep a watchful eye for the ever elusive Bandidos. South San Antonio is a little rough around the edges. 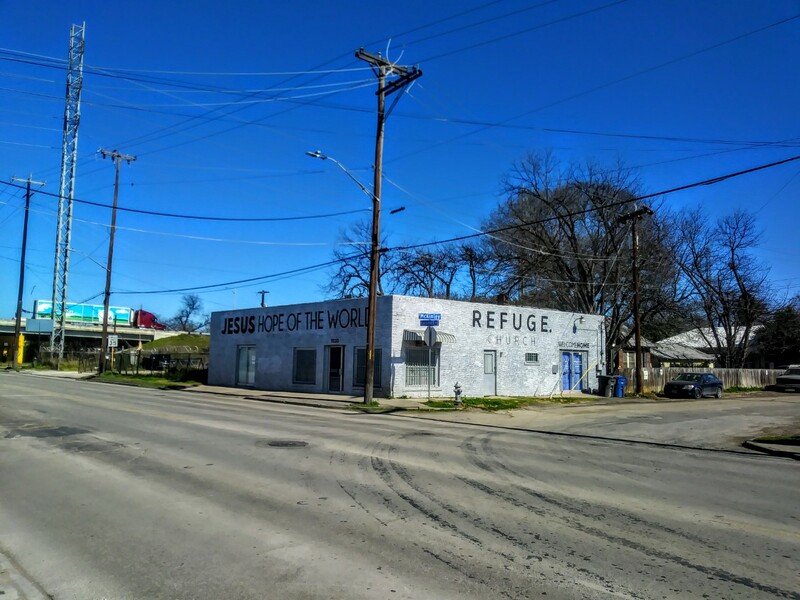 The neighborhood where Carnitas Lonja sits hosts a rundown motel, a raggedy church, the Bexar County juvenile detention center, and a clutch of weathered bungalows that were built during the Pappy O’Daniel administration. The streets would do New Orleans proud what with all the ridges, humpbacks, potholes, and fissures. The restaurant is tiny seating two people inside and a few dozen on a brace of wooden picnic tables in the dirt courtyard. You order at the counter and a foodrunner brings the meat to you as the kitchen ebbs and flows with the current of diners. If the carnitas are good the tortillas are magnificent. 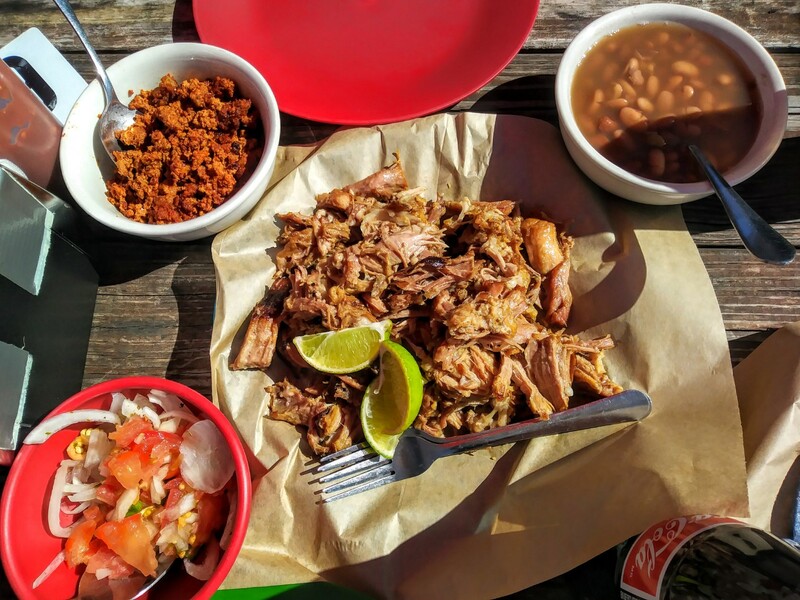 Even in a land where scratch tortilla-making is part and parcel of the everyday dining experience Carnitas Lonjas stand out. There is an intrinsic corn flavor at play here that speaks of a tortilla lady worth her weight in gold. Marrying a woman with hands as skilled as hers is something I’ve long fancied. The carnitas are rich and lush; these are the slow-roasted, near confit-style that many cooks aim for but fall short of rendering. Unfortunately some of the other dishes on the brief menu fail to attain the high status of Paredes’ carnitas and the mystery woman’s tortillas. A house chorizo is dry and crumbly and offers little in the way of deliciousness. A bowl of vividly green, unseasoned guacamole is crying out for a basket of hot salty totopos but none is on offer. That should change in the future. Pinto beans are plain as a parson’s vestment and crying out for salt and acid. They’re soupy and well-cooked but the chef forgot the Morton’s. On a brighter note, a bowl of vinegar-marinated pico de gallo is the perfect foil to the absurdly rich meat. Service is a breeze, the counter girl is a peach, chatty and forthright, and speedily ministering to the entire restaurant. You could build a business around a worker like her. For $15 you get a pound of carnitas and five of those wondrous tortillas. By the time we tacked on drinks and sides we’d spent about $40. This was enough food for four big eaters. I half-expected to look over and see John Steinbeck pecking away at a typewriter on one of the wooden picnic tables. South San Antonio would’ve made a fitting setting for one of the great man’s novels. That will change soon. San Antonio is rapidly growing and the little barrios are being buffed and polished for the arrivistes from Tacoma and Cedar Rapids. This entry was posted in FOOD, On The Road With RL Reeves Jr and tagged (210) 612-3626, 1107 Roosevelt Ave San Antonio. Bookmark the permalink.